Our house remodel has been completed for the last few months so now I've been working on getting this place put back together. This is definitely all still a work in progress so I have a hard time really calling these the "after" photos, but I thought I would share where we are right now. The main thing we have left to do is to put in a backsplash in the kitchen. I honestly got a little burnt out with decisions and was also feeling like I really needed to see the space completed before making a choice on tile. Otherwise, all the major stuff is complete! Now I just need to find some more appropriately sized items for the tall shelves (HA) in the living area and to make sure the furniture arrangement is working for us. The kitchen had a pretty good general layout to begin with and was a great size. We did gut the whole thing and redid the floors. I wanted to keep the original floors but they had split the kitchen and living area in half, with wood in the kitchen and carpet in the living room. Unfortunately, there was no wood underneath the carpet and to make the existing wood match with new was actually going to cost more than just putting all new wood down. They also had a short, fat island and had left space for a table, but with the dining room just a few steps away, we decided a long island (12 ft) would make the best use of the space and would work well for our family. The beams are the same except we had the brackets sprayed black (thanks to our realtor @thehomescoop for that suggestion) and I think it helps the whole beam stand out a little more. I mentioned on Instagram that the railing above the kitchen is a kids play loft that the original owners had put in. There's a ladder in the hallway to access it. My kids love it! I found a lot of things on Amazon and eBay, which definitely saved some money. There were a few faucets I looked at on other sites that were going to cost as much as my fridge! I linked up what I could below. I'm so glad this little sitting is right off the kitchen. We end up hanging out here pretty frequently, even though it's not our main hang out space. It's great for while I'm cooking or just sitting and chatting. This area didn't need too much...we ran the hardwood through this area so it flowed a little better. We painted the built-ins and brick, retiled the hearth and put new doors and hardware on the lower cabinets. I love all the original brass sconces throughout the house! The main pieces of furniture were all thrifted from our local Craigslist type site and I reused a lot of items from our last house! I did try and put links to some of the items at the end. You. Guys. I entered Emily Henderson's Christmas mantel styling contest on a whim last week. And guess what? She selected mine as one of the winners! I feel a little bit starstruck. She happens to be my favorite designer and the one I find my style closest to so I squealed when I saw the winners last night! You can check out the other winners here! I didn't buy many new Christmas decorations this year just because we were in the middle of moving right before Christmas. I found a few things from Land of Nod...they had some great Christmas decor this year (all on sale now)! I also grabbed some Dollar Store Christmas houses that I spray painted gold and white. Everything else I found from my Christmas collection from years past! I toyed with this for a little arrangement for a little bit, but ultimately I thought it was a little too cluttered. Here are the little houses I painted. I tried out 2 different methods with the white houses. One where I covered the whole thing and the other where I left some color showing through. We installed 2 pendant lights in the living room (I actually discovered them through Emily's Pinterest board) and we love them! You can see a sneak peek of them below. I saw the news that Spoonflower is offering removable wallpaper this morning (via Hank and Hunt) and it made my morning! I've been searching high and low for the right wallpaper to use for a project when we get home (in one week!) and I'm having a hard time finding something I love that is not a billion dollars per roll. Plus, I've already been toying with the idea of making it removable so it's not such a permanent design decision. Not that we're afraid of wallpaper (see our office here) but I just like the option of changing it on a whim. What's even cooler about Spoonflower is that you can create your own patterns! So that means I can make my own original wallpaper and customize it perfectly to me. Oh and did I mention it is totally affordable?! I feel like I might take on a few too many wallpaper projects now, just because I can. In January I featured some gorgeous kilim (Turkish rug) pillows from Organic Shine Society. I loved them so much but they were upwards of $100 per pillow, so I kind of brushed them off. Well a few weeks ago I dropped by the Eastern Market in DC (a great Saturday morning venture if you're ever in the area). I think I got absolutely giddy when I stopped by a stand full of kilim pillows and rugs. I was even more stunned when he told me the prices on his pillows. He was selling them for wholesale price...I was able to get 3 of these for less than 1 of the OSS pillows! I have carried around his biz card the last few weeks, and of course I can't find it now, but he's there every Saturday and Sunday. Here is inspiration board #2, again using thrift store sheets as my starting point. I really like both boards for very different reasons. Luckily I have a few months to pull things together and make my decision! To see board #1, go here. Do you have a favorite out of the two? I'd love your opinion! We will be moving around a lot in the next few months. I'm sure I'll share more as soon as everything is solidified, but for now, I'll just share that we are likely moving a very short distance this fall. 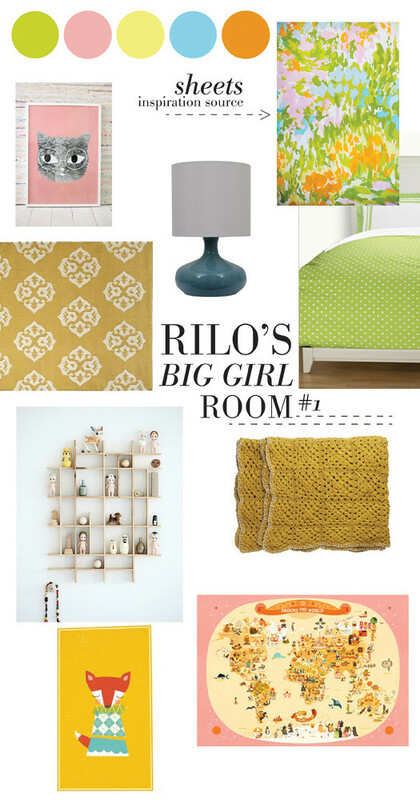 As we move, I would love to transition Rilo to her big girl room! I shared two sets of sheets I recently fell in love with from the thrift store. I've put together a board using each set to decide which I like better. Both would be really cute I'm sure! I'm not a huge purple fan but I felt pretty inspired by these spaces. They do purple well, don't you think? Yes, yes and yes to these 3 spaces. Love the black and white touches in all of them!